An intramural ventricular septal defect (IVSD) is a type of interventricular communication that can occur following biventricular repair of a conotruncal malformation (such as double-outlet right ventricle (RV), truncus arteriosus, and tetralogy of Fallot [TOF]). It does not represent a true defect in the ventricular septum but instead results from suturing of the VSD patch to the RV-free (parietal) wall such that intramyocardial RV trabeculations traversing beneath the patch attachment site enable blood flow between the ventricles [Figure 1]. While others have described the clinical and imaging features of IVSDs, images of their actual pathology have not been previously published.,,, In this report, we present the clinical course, diagnostic imaging, and postmortem pathology in two patients with IVSDs. A 7-month-old male with VACTERL association was admitted for cardiac surgery. His preoperative diagnoses were (S, D, D) double-outlet RV with severe pulmonary stenosis, large malalignment VSD, and multiple muscular VSDs. He had previously undergone stenting of the ductus arteriosus. Surgical repair consisted of a Rastelli operation using a 14-mm RV to pulmonary artery (PA) valved conduit. The postoperative transesophageal echocardiogram (TEE) demonstrated multiple muscular VSDs that were not addressed at the time. The patient's postoperative course was complicated by heart failure symptoms. Cardiac catheterization performed on postoperative day (POD) #7 demonstrated multiple VSDs, a pulmonary: systemic flow ratio (Qp: Qs) of 2:1, and a left ventricular (LV) end-diastolic pressure of 19 mmHg. On POD #11, he underwent repair of the muscular VSDs from a left ventriculotomy. However, postoperative TEE showed a large subaortic VSD and another small peri-patch VSD. Repeat cardiac catheterization (POD #56) revealed a Qp: Qs of 2.5:1, a small LV lateral wall aneurysm, and a large subaortic VSD. On POD #60, another surgery was performed to close this defect, but it could not be located. The patient had a difficult postoperative course but was eventually discharged on POD #168. A cardiac catheterization at 15 months of age continued to demonstrate a large subaortic VSD [Figure 2]a, but the Qp: Qs had decreased to 0.9:1 due to pulmonary vascular disease. A TEE (performed at the time of the catheterization) ultimately identified that VSD was intramural [Figure 2]b. The patient expired at 18 months of age due to a pulmonary hypertensive crisis. [Figure 2] shows the postmortem specimen. A 23-month-old male with TOF and total anomalous pulmonary venous return to the right atrium, who had undergone complete repair at an outside institution, presented with heart failure. The transthoracic echocardiogram (TTE) demonstrated free pulmonary regurgitation and a moderate-size VSD at the superior patch border as well as another small defect, both thought to be peri-patch VSDs. He underwent VSD repair, left PA augmentation, and pulmonary valve replacement. The postoperative TEE demonstrated a residual subaortic VSD, though this defect was inconsistently visualized on multiple follow-up TTEs. He was discharged on POD #51. At 28 months of age, cardiac catheterization revealed a Qp: Qs of 1.9:1. By angiography, the VSD was recognized as intramural, a finding also noted by TTE [Figure 3]a. At 35 months of age, surgical repair of IVSD was attempted with the aid of a guidewire placed across the defect by preoperative cardiac catheterization. Despite visualization of the wire from the aortic valve (AoV), the IVSD could not be identified. Surgical closure was then attempted from an LV apical incision, and a defect on the ventricular septum (thought to be IVSD) was repaired. However, the IVSD was still present on postoperative TEE. A computed tomography scan was performed to better characterize the defect [Figure 3]b for attempted occlusion in the cardiac catheterization laboratory. However, the catheterization was aborted due to patient instability. Two weeks later, the patient had a cardiorespiratory arrest during endotracheal tube taping and expired. [Figure 3] shows the postmortem specimen. IVSDs have been noted to occur in up to 11% of patients with conotruncal anomalies who undergo biventricular repair and are associated with significant morbidity and mortality., As previously mentioned, IVSDs are not truly defects of the ventricular septum; instead, they are formed by intramyocardial channels in the anterolateral free wall of the RV. As such, their location is separate and remote from the interventricular septum, and they are anatomically distinct from the malalignment type of VSD typically associated with conotruncal defects. Furthermore, they are generally not diagnosed until after cardiac surgery when the placement of the surgical VSD patch enables LV to RV shunting through the intramyocardial channel (s). However, even postoperative identification of these defects can be problematic: in one series, only 56% of IVSDs visualized by postoperative TTE had been identified on the postoperative TEE. In our two cases, the IVSDs were initially thought to be peri-patch VSDs and were not diagnosed as IVSDs until much later into their postoperative course. Given their unusual location, it has been well documented that surgical attempts to visualize and repair IVSDs from RV and LV approaches are generally unsuccessful,, and we encountered this difficulty as well. Some authors have advocated repairing IVSDs through the AoV, but surgical visualization with this method can still be difficult, particularly if the defect is located anteriorly. This was the case with our second patient: even with a guidewire through the IVSD, the defect could not be clearly seen from the AoV due to its unusual anterior location and the fixed position of the heart. This report is the first to present the actual postmortem pathology of IVSDs. While we cannot conclude that our findings are representative of all IVSDs, the striking anatomic features in these two patients illustrate the challenges in diagnosing, visualizing, and closing these defects. The IVSDs were large and anatomically complex and were positioned superiorly and anteriorly due to the dextroposed aorta. Located between two aortic leaflets in the intercommissural triangle, they were nearly contiguous with the AoV. The primary defects were circular and gave rise to multiple fenestrations that fed intramyocardial channels (trabeculations) coursing through the RV-free wall [Figure 2]c, [Figure 2]d and [Figure 3]c, [Figure 3]d, [Figure 3]e. These channels then emptied into the RV at multiple sites located more inferiorly, some of which were obscured by the anterior tricuspid valve leaflet. 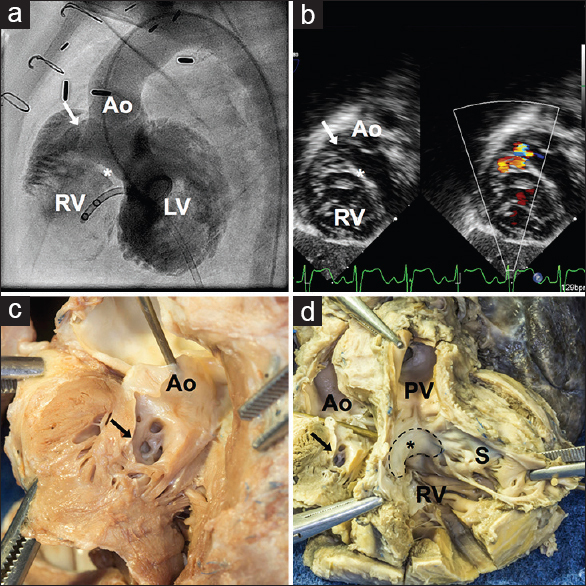 The trabeculations produced a spongy appearance of the anterior RV myocardium [Figure 3]e.
We conclude that, in patients undergoing repair of conotruncal anomalies, an IVSD should be considered when residual ventricular shunting is detected. Adequate imaging of the RV-free wall just superior to the anterolateral attachment of the VSD patch is imperative. When IVSDs are identified, given the complex anatomic nature of these defects, alternative surgical approaches might be necessary. Patel JK, Glatz AC, Ghosh RM, Jones SM, Natarajan S, Ravishankar C, et al. Intramural ventricular septal defect is a distinct clinical entity associated with postoperative morbidity in children after repair of conotruncal anomalies. Circulation 2015;132:1387-94. Preminger TJ, Sanders SP, van der Velde ME, Castañeda AR, Lock JE. “Intramural” residual interventricular defects after repair of conotruncal malformations. Circulation 1994;89:236-42. Patel JK, Glatz AC, Ghosh RM, Jones SM, Ravishankar C, Mascio C, et al. Accuracy of transesophageal echocardiography in the identification of postoperative intramural ventricular septal defects. J Thorac Cardiovasc Surg 2016;152:688-95. Belli E, Houyel L, Serraf A, Lacour-Gayet F, Petit J, Planché C, et al. 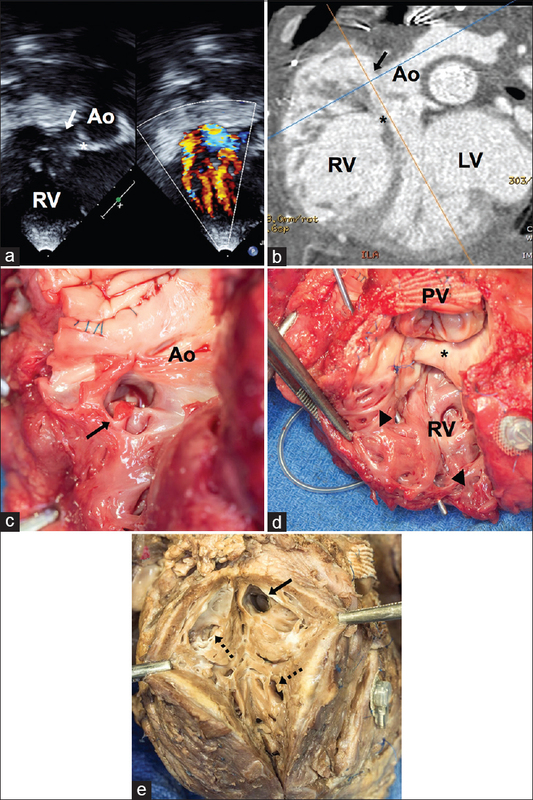 Transaortic closure of residual intramural ventricular septal defect. Ann Thorac Surg 2000;69:1496-8. Buratto E, Naimo PS, Konstantinov IE. Intramural ventricular septal defect after repair of conotruncal anomalies: Is there light at the end of the tunnel? J Thorac Cardiovasc Surg 2016;152:696-7.